For agricultural and garden use. Ideal for equestrian use and cattle tracks. Suitable for indoor and outdoor use. It will provide a longer life span than conventional surfaces, as it will not get clogged when wet. It also helps minimise back and leg injuries, kickback etc. 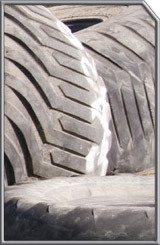 Fine rubber shred is suitable for cow tracks and equine requirements e.g. Arenas and Sand Schools.